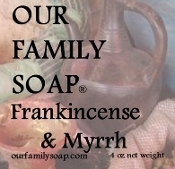 Our basic soap combined with exotic Frankinsence and Myrrh EO. Rich, warm, exotic, sensual scent...takes you away to far away places..a vacation for your soul! Generous 4 oz bar. A combination of olive oil, coconut oil, palm oil, sodium hydroxid (lye, neccesary for soap making), natural coco butter, Frankinsence and Myrrh EO.